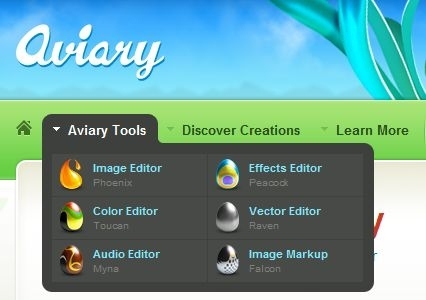 "Aviary, the cool web-based suite of image editing tools -- and more -- now costs nothing to use. Thanks to a new round of funding, full access to the web apps with the funky bird names no longer costs $24.99." Jay Hathaway, at DownloadSquad.com, picked up on Aviary's new status ("Free!") from TechCrunch, and both sites compare Aviary favorably with Adobe's web version of Photoshop. A visit to Aviary's website shows a number of available tools, most of which are shown in the menu capture above, along with many samples of work done using these, over 70 tutorials, an active community, and a regularly updated blog. Registration was easy, and provided essentially immediate access to the tools. The couple of tools I sampled seem well presented, with apparently powerful options, but - at least for myself - these would require a fair amount of tutorial time to learn how to properly use. I will stick with Photoshop Elements and Paint.net for the time being, but if you like playing around with images, Aviary is certainly worth a look!